Widewalls[W]: Could you remember what was your first contact with the world of art? [W]: Would you please explain your technique a little bit? [R]: First, I prepare a container. 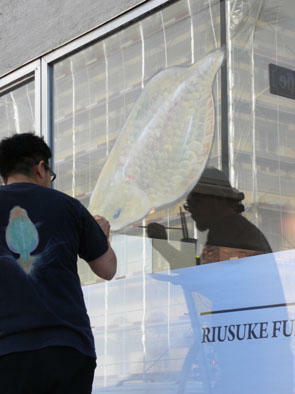 Inside, I would pour resin for a depth of 1cm. I wait for two whole days for the resin to harden. 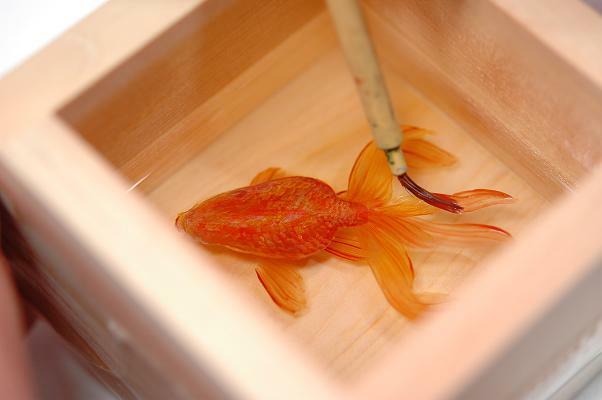 Once the resin completely hardens, I would paint the fins of the goldfish with acrylic paint on to the surface. I then pour in another layer of resin. 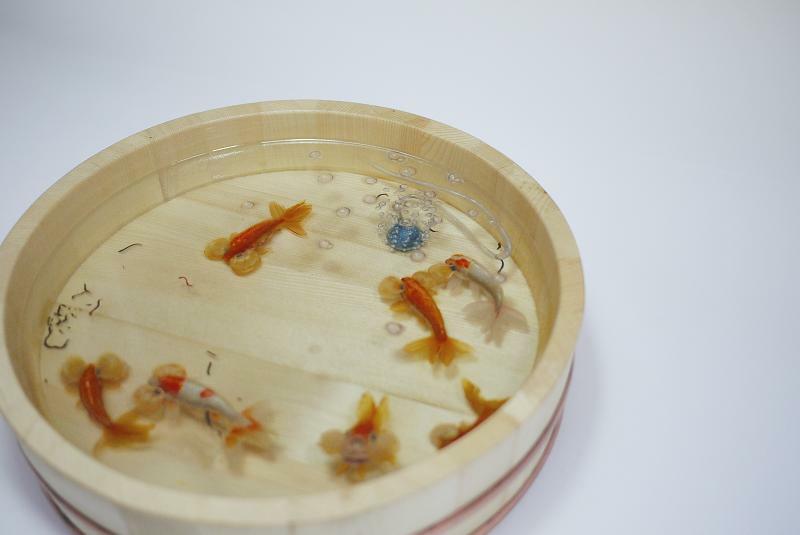 Waiting for another two days for the resin to harden, I would paint the body of the goldfish. 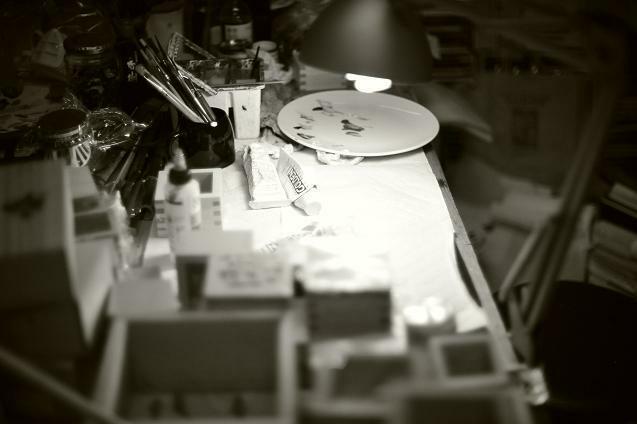 I then pour another layer of resin, wait two days, paint…. I repeat this process to create a three dimensional goldfish. It takes time for each layer of the resin to harden, hence, it takes a long time to create one piece. For the container, I use common household objects like used dishware or something I picked up off the side of the road, bought at antique shops or even thrift stores. Not every container works. I only use containers that I can “see” goldfish swimming in it. [W]: What excites you the most when it comes to 3D painting? Could you describe the significance that sculptural work has for your artistic practice? [R]: After completing a piece, I love seeing my goldfish swimming freely as if life was bestowed upon it. In order to see the final product come to life, the creation process does require a lot of effort and patience, and it does take a physical toll on me. Although it drains me, I keep working to see each of my goldfish come alive. 3D painting is a result of combining two techniques: painting and resin. 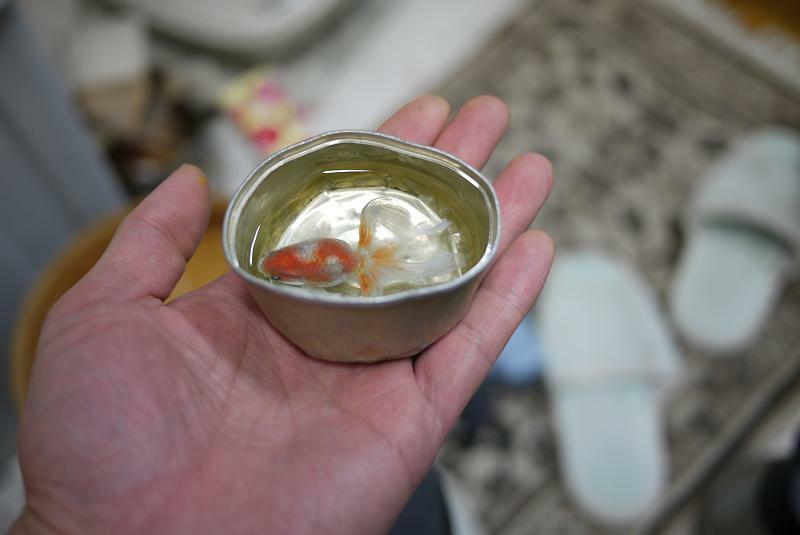 By doing so, I am able to express a new found liveliness of the goldfish. [R]: Claude Monet is known for his water lilies, but I don’t necessarily believe that he was very particular with his choice of water lilies. As proof, in his paintings, he is not concerned with a specific type of lily. 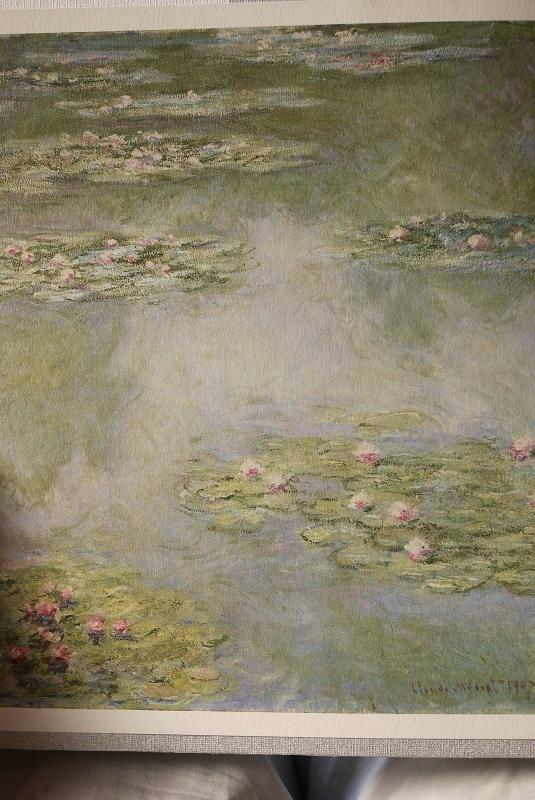 Monet used the water lilies to locate the water’s surface, applying an optical interpretation to his paintings. He transformed his work of art into a science. I believe that there is a notion of western materialism in his work. On the other hand, he is also famous for his love of Japonism. This explains why there is a mixture of both western and eastern influences in his works. Another factor that I believe reveals eastern influences in the water lilies is that perhaps the reflection of the blue sky and the transparent bottom painted on the water’s surface. This is Monet’s way of depicting not the real world, but what the world would look like on the “other side.” In other words, I think that Monet was trying to paint the spiritual world. I can’t help but to think that the water lilies symbolizes as a border between the spiritual and the material world. In Monet’s paintings, both materialism and animism are present. The goldfish that I paint is very similar to the relationship as of Monet and his lilies. The goldfish’s breed is not what is important; the very existence of goldfish itself is the key. The goldfish I paint is both a representation of me and a metaphor for human existence. To me, what is underneath the surface of the resin symbolizes the spiritual world. Even while I paint, I believe that what lies under the surface is a spiritual world where the painted goldfish and seaweed come to life. This is eastern animism. This stems from an experience I had as a student, when I visited a museum displaying Buddha statues and I felt as though they were moving. From that moment, I was determined to bring life to all of my works. On the contrary, I also know that what is underneath the surface is just matter and substance. It is a product of numerous layers of plane surface painting, and is in fact a world of just resin and acrylic paint. Therefore, similar to Monet, my art work is also a combination of animism and materialism. [W]: The aesthetics of your works is both contemporary and traditional. How would you describe it? [R]: I will explain the aesthetics of my work by describing how I invented the resin technique. First of all, please think of what it means to use paint and pencil to draw on to paper. 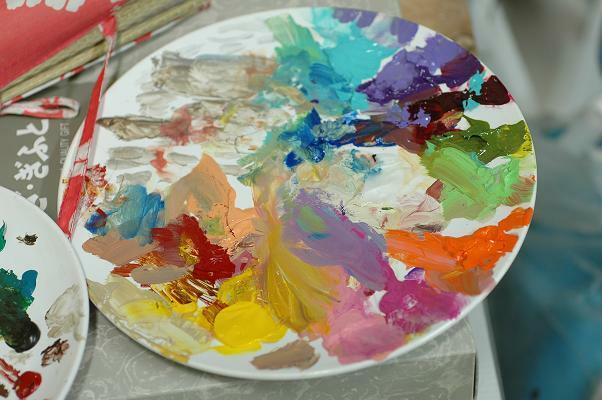 The concept of “painting” is placing “pigment” on a “flat base”, such as, paper, canvas, and wooden slates. Many abstract expressionists in America during the 1950s spoke out to dismantle the idea of traditional painting and moved towards the flatness of the plane. They advocated the relationship between flatness and pigment and how that has not changed since the first time humanity has started to draw, approximately 3000 years ago. With that being said, my technique consists of drawing on hardened resin surface, which is true to the idea of flatness and pigment, yet it does not veer far from traditional painting. However, the following step requires me to pour liquid resin on to the painted surface. This is where the notion of painting undergoes a transformation. 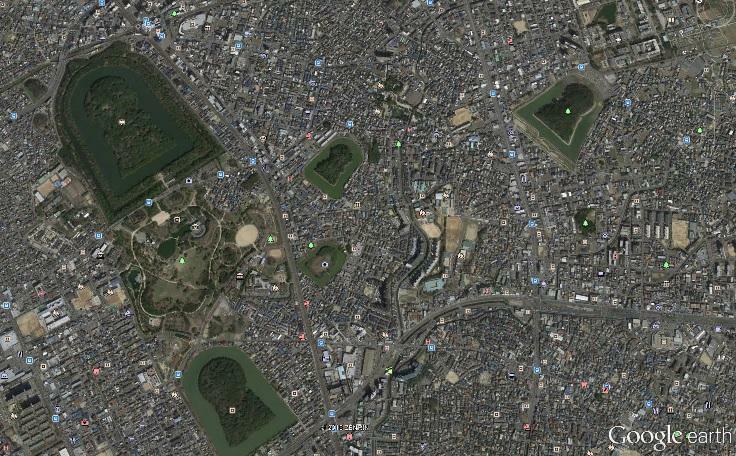 The flat surface disappears. The relationship of flatness and pigment is broken, and only the pigment appears on the resin. Could you call a painting without a surface, painting? Should we call it a sculpture? This is my question to the present age. This technique has not existed in the history of art for 3000 years, and I strongly believe that this is a truly innovative form of painting. In addition, by utilizing clear resin, a more modernized material, the pigment is liberated from the limitation of the flat surface, casting a shadow at the bottom off the container. This shadow is humanity’s first look at an imprint left by the artist’s pure act of creation. [W]: The way you observe and treat goldfish is very philosophical, very meditative. How much of your inspiration is rooted in traditional Japanese philosophy? 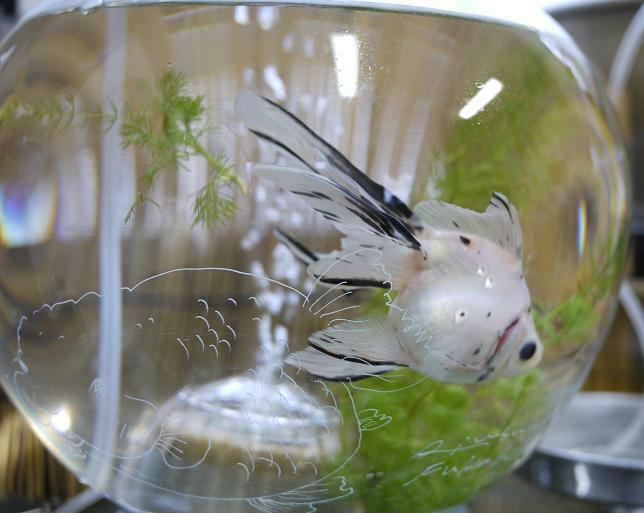 [R]: People may think that I see goldfish in a philosophical light, but that is because like all Japanese, I have a very distinct view on goldfish. I am merely expressing what I see or feel in my day to day interactions with goldfish. But underlying this may be a special Asian or Japanese sentiment. Japan has a very long history with the goldfish, and there is a distinct emotional attachment to them as opposed to other domesticated pets. I only incorporate this unique sentiment into my art work. 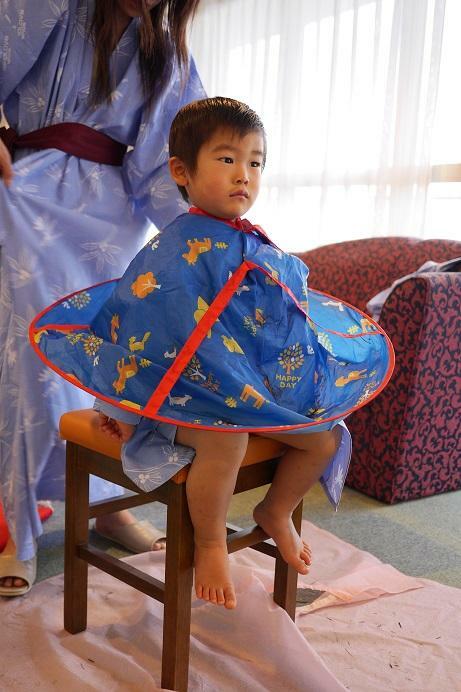 Being Japanese, it is a very natural perception. People from other parts of the world just saw that as different and new. I draw my inspiration for my art work from different places, but my greatest inspiration is “Sadou,” the Japanese tradition of ceremonial preparation and presentation of tea. It may sound very simple, yet it is not just about making and drinking tea. Sadou requires spirituality. 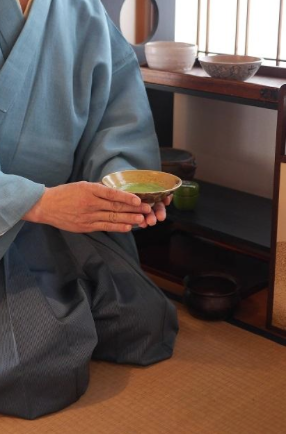 My grandmother in Nagasaki was a sadou instructor, and every time I would visit her, she would prepare tea for us, and was able to observe many beautiful tea bowls. I peek inside the tea bowl and imagine the past. 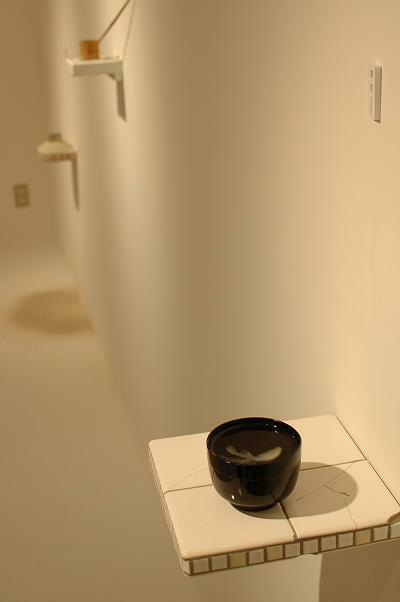 The experience of holding and seeing beauty in the small cracks and smudges on the surface of the tea bowls allowed me to cultivate my own spirituality. Japanese sadou culture’s unique aesthetic is based on “Wabi Sabi,” meaning austere beauty. I always incorporate this aspect into my art. This unique aesthetic comes in to play when I select the container for the goldfish. Anything that catches my eye because of its subtle beauty- an expensive antique ware, a plastic container, an aluminum can, or even a dent in the mortar- I simply pour resin in to them and paint goldfish in it. This is how “wabi sabi” is reflected in my work. [W]: Would you say goldfish are helping you reach enlightenment? [R]: Most definitely. To me, goldfish is everything. It’s like J.M.W. Turner’s understanding on his perception of depth, or Claude Monet’s love for his lilies, or Marcel Duchamp‘s conceptual thought. By acknowledging the presence of goldfish, I was able to proceed to a deeper level of expressionism. 15 years has passed since I was saved by my goldfish, and I refer to that incident as “goldfish salvation.” But all this time, I realized that I have only been trying to figure out why I had felt the sense of unease and the beauty in the goldfish, why I saw myself overlap with the goldfish, and the passion that fell upon me at the moment. I will continue my journey to find the answer. [W]: Could you please share something concerning your future plans? [R]: I am planning to explore and develop newer technique with resin. I am sure that there are even more creative ways to express my work. I would also like to perfect my work on flat surfaces and objects, and let more people see and enjoy my work!